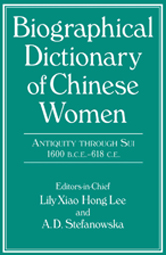 Biographical Dictionary of Chinese Women: Antiquity Through Sui, 1600 B.C.E.-618 C.E. Editors: Lee, Lily Xiao Hong and Stefanowska, A. D.
This new volume of the Biographical Dictionary of Chinese Women, spans more than 2,000 years and recovers the stories of more than 200 women, nearly all of them unknown in the West. Empresses and consorts, nuns and shamans, women of noteriety or exemplary virtue, women of daring and women of artistic or scholarly accomplishment--all are to be found in this remarkable dictionary.